Home remodeling and fashion don’t usually have a lot to do with each other. But interior decorating can – and sometimes does – borrow from the world of beauty. The biggest trends in 2014 give the best opportunity for genre crossover in years. Give these fashion crazes consideration when working on home remodeling. Pastels are dominating the fashion season this year. Watery shades – perfect for warm weather – can be incorporated into any room in your home that gets lots of natural light. Whether it’s the furniture in front of a bay window or artwork in an entrance way, washed-out pastels are huge for fashion-savvy pedestrians outside your home – and they can be inside your home as well. Windowpane grid patterns – especially in high-contrast colors like black and white – have emerged as winners this fashion season. Huge with hats, dresses and skirts, windowpane patterns are more than just squares. They bring opposing colors to life on high-end garments – and they can do the same with your home remodeling. When your home improvement project calls for a bright, bold statement, go for the grid. 2014 is replete with gem-emblazoned fabrics. Embedding things that sparkle and shine naturally into flat or earth-toned colors is nothing new. But 2014 is reinventing the concept. Homeowners, too, can stud curtains or hang tapestries with mock gems. Oversized buttons are back – and for some, they never went away. Adorned on hats, dresses, purses and shoes, one of 2014’s hottest crazes can be integrated into your home improvement project as well. Perfect for couch or chair upholstery, ottomans and even as cinches for drapes, oversized buttons aren’t just for fashion anymore. Borrow from fashion trends when establishing your home’s style. Home remodeling can benefit from thinking outside of the box. 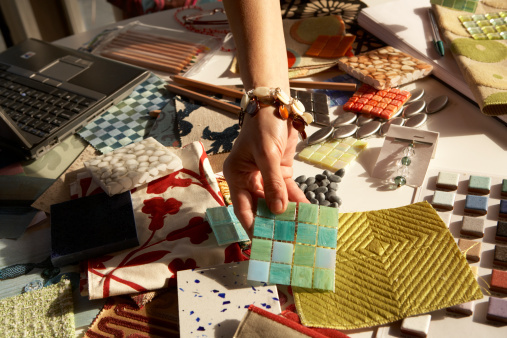 When designing – or making over – your home’s interior, look to the fashion world. 2014’s hottest trends outside can make their way inside as interior decorators and designers borrow from fashion to improve home design. Have you been inspired? Take a look at eieihome’s directory of interior design and decor professionals.